Quadriceps tendonitis occurs when the quadriceps tendon which attaches to the top of the knee cap is inflamed, causing pain. Quadriceps tendonitis typically occurs due to repetitive or overuse causing strain. This injury is common in athletes involved in sports with quick changes of speed and repeated jumping like volleyball or basketball. Pain occurs at the top of the knee. Athletes should wear a brace for quadriceps tendonitis to provide added stability and incorporate rest, ice, compression, and elevation. 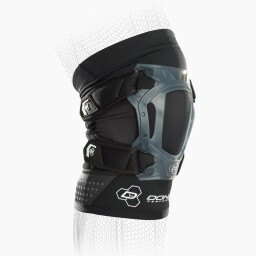 As an athlete moves towards activity and sports, it is important to warm-up, always wear a knee support that provides compression and remember to cool-down afterwards. Rehab includes stretching and strengthening exercises for the quad, hamstring and IT band for a full recovery.